While workplace wellness may not be news around the office water cooler, this water cooler is certainly causing some talk. Bevi is a modern water cooler that has saved the use of more than four million plastic bottles since its launch in 2012. What originally stemmed from founders Sean Grundy, Eliza Becton and Frank Lee’s environmentally-focused motivation to eliminate the infamous and wasteful plastic bottle, quickly saw an organic shift in target audience from environmentalist gym goer to resource-centric tech companies. So far, offices including Apple, TripAdvisor and the Bozzuto Group, have installed the modern water cooler as a resourceful way to replace bottled beverages, while saving a company’s time and money in providing workplace benefits. Yet, as more companies committed to improving company culture, more employers across the field saw the demand for this developed culture from potential employees; therefore, they becoming obligated to keep up with the trend. “I never would have thought of General Electric as an ideal target company for us but they are showing a commitment to providing the same perks and company culture that Apple and Twitter have been offering for a while,” says Grundy on Bevi’s recent extension to General Electric’s offices. Along with witnessing the increase and expansion for workplace benefits across new industries, the founders have discovered a pattern in various companies’ desire to improve their office offerings. For companies installing a Bevi, they not only add to the desirable, healthy work environment for a future employee; however, they also benefit by saving money, time and resources in the long run. 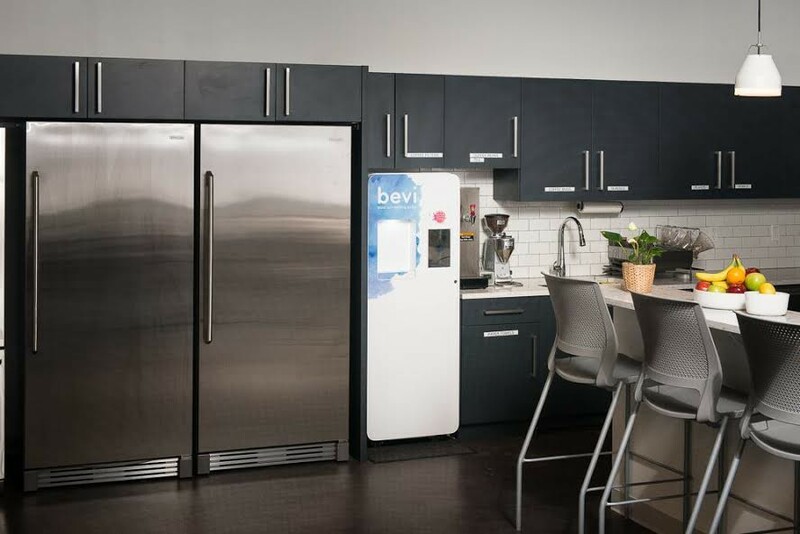 This is a direct result of the cooler’s installation and maintenance process, as the only thing an office needs to accommodate a Bevi machine is a water line and a regular power outlet — drawing as much energy as a standard coffee maker — leaving the rest up to the Bevi team. This includes the installation, plumbing, stock checks and refills. 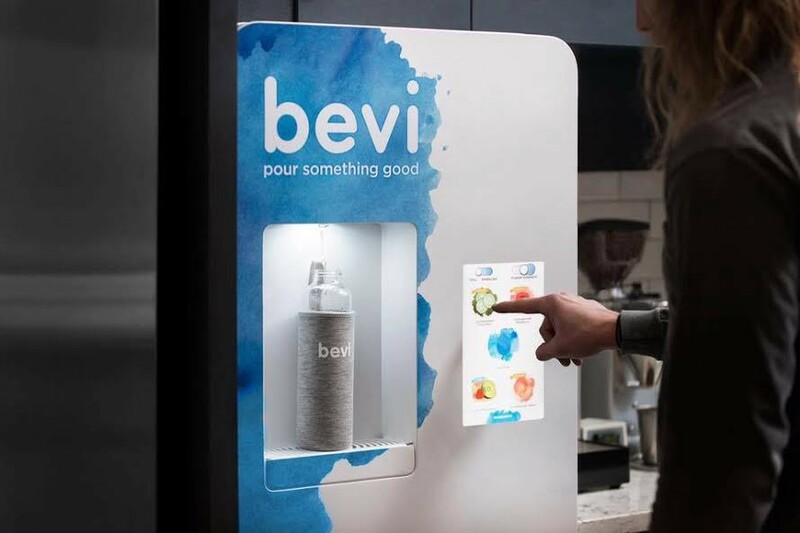 “With Bevi, it’s an all-in-one machine so you don’t have to worry about providing ten different types of drinks,” says Becton on the regular filtered water, sparkling water and flavored drink options that the company has access to once installing the machine. With this growing recognition, Bevi continues to extend into new divisions, reaching back to their roots at health clubs, with major clients like Equinox, and in hospitality, with the W Boston being the first hotel to have updated to this savvy water offering. The organic and steady growth reveal how although the original, environmentally-conscious aspect of the brand may not have been at the forefront of Bevi’s branding, it was always there as a direct, and positive, side effect to diminishing waste across a substantial space. Thus far, Bevi has not just played an important role in workplace wellness, but has created somewhat of an environmental and social precedence for workplace standards.